A man and a boy are on the road, heading south towards the coast. We never find out exactly what disaster befell the world several years previously, but the landscape is covered in dust and ash. Nothing is alive except for a few people desperately trying to survive; some have turned to cannibalism, while others search for canned food or remains of grain in long-abandoned buildings. Will the man and the boy survive the trek through mountainous terrain in the winter snows, and will they find a better world if they do reach the coast? We are never told the names of the man and the boy, but the boy calls the man Papa so they are obviously father and son. There is in fact only one character who is named in the novel, and as it turns out this is not his real name. But names matter little in this devastated world. 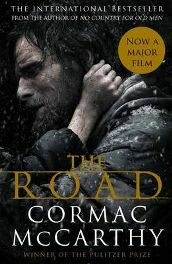 Cormac McCarthy’s post-apocalyptic ‘The Road‘ takes place in the bleakest of settings where a boy who has never known a better life witnesses the lengths to which some human beings will go in order to satisfy their hunger. This is a harrowing tale, and yet the bond between the father and son creates a wonderful sense of humanity that rises above the horror and ugliness around them. The boy has developed a tremendous compassion for his fellow human beings and on several occasions finds it extremely hard to accept his father’s hard-heartedness. The compassion, however, perhaps stems from naivety, and the father is concerned above all about the welfare of his son and their own survival. At times dreams appear to play as much a part in the man and the boy’s consciousness as the events of their daily lives do. We are given details of the man’s dreams from time to time, but the boy always refuses to talk to his father about the nature of his dreams. All we know is that the father has explained to his son that good dreams are a bad sign and vice versa. There are few other characters in the novel; other people fall into either the ‘bad guys’ or the ‘good guys’ category. The good guys are very few and far between, whereas the man and the boy are always on the alert for the bad guys who are likely to outnumber them. There is a scene explaining the disappearance of the boy’s mother, and as a mother myself I found it hard to accept her course of action. The boy never mentions her, but it is difficult to imagine what thoughts he must have bottled up inside him. Dialogue between the man and the boy is usually in the form of a series of brief exchanges. McCarthy doesn’t use speech marks or state, for example, ‘the man said’, and this occasionally causes confusion as to who is saying what to whom. It isn’t, however, a major problem. What is most striking about the writing style is that many episodes are detailed accounts of mundane procedures concerned with, say, preparing food or packing bags, yet McCarthy’s prose is often almost poetic: ‘The world shrinking down about a raw core of parsible entities.’ Sometimes sentences are not complete sentences, but this seems to add to the effect. I found the novel extremely easy to read; there are no chapters as such, but the book is divided into very brief sections. It is easy to find a stopping place, yet also tempting to think ‘I’ll just read one more section’. There are just over three hundred pages and I read it in a few hours over the course of three days. It is a compelling novel, yet having finished it, it deserves perhaps a second slower reading to dwell on McCarthy’s poetic nuances at leisure. I didn’t expect to enjoy, if that is the right word, this novel as much as I did. I didn’t know whether I would in fact be able to read a story that sounded so harsh and horrific. But the feeling that I was left with was one of admiration for the father’s unconditional love for his son and his relentless determination to seek a better life for him. In such a world, I would imagine that many would decide it was pointless to go on living; giving up or taking one’s own life would seem an easy option. Yet in ‘The Road‘ we see a man who believes that if there is the remotest chance of a better life for his son, then he must lead him to it. Some readers feel that the dominance of male characters make this a novel more likely to appeal to men, but I think it’s unlikely that I am the exception that proves the rule. There are those who interpret McCarthy’s message here as a warning that this will be the world of the future if we continue to live the way we do. I’m not totally convinced that this is McCarthy’s intention in ‘The Road‘, as he never explains what it was that happened so it could have been a natural disaster. What stays with me is still the intensity of the father-son relationship; the boy does not by any means always approve of or understand his father’s actions, yet they develop a moving bond that will touch the heart of any reader. There are violent and harrowing scenes here, but they are not the overriding theme for me. Even if you would normally shy away from a novel that appears to centre around devastation, I would recommend reading ‘The Road‘ for its focus on the way that a human relationship can transcend disaster. No Comments on "The Road"